To Cover Letter or Not to Cover Letter? Technology has changed so greatly in such a short time. Mail is not sent via, well, actual mail anymore, therefore the cover letter written on personalized stationery is long defunct. Online applications and e-mails to employers are now standard practice. Some companies leave a spot for an optional cover letter within their online application system while others don’t require it. 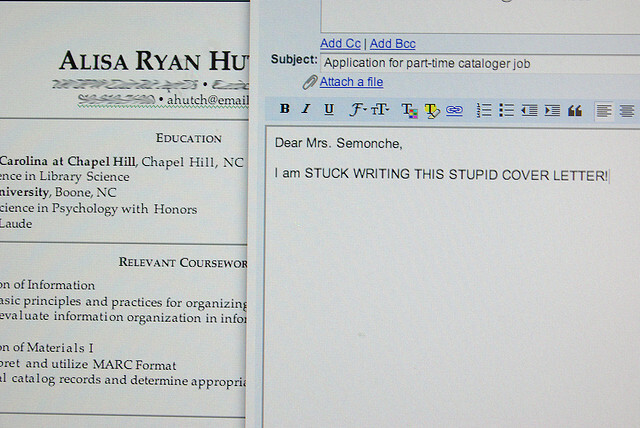 But then if you write an e-mail to accompany your resume, do you use that space as a cover letter opportunity? Just how should we approach this conundrum? There’s not one right answer: people have landed a position without a cover letter. Some recruiters just skim cover letters, while hiring managers are more likely to read them. But, even if 50% of those receiving your info read your cover letter from top to bottom, then it’s probably a good idea to do your best. Think of a cover letter not as added work, but as a bonus opportunity to make an impression. To differentiate yourself from a pile of qualified candidates. To showcase your writing skills, which can’t be detected in a resume. A clearly written and well-edited cover letter shows the hiring manager you pay attention to details and can clearly express your thoughts. To clarify any chronological inconsistencies in your resume. To illustrate your passion for a particular position, corporation, or industry. To showcase your specific accomplishments. To help yourself begin to understand “why” you want this position. To get in some good practice for your upcoming interviews—this is good homework for you! To express clearly why you are applying for this position when it doesn’t seem like an obvious choice for you based on your resume. To highlight parts of your resume that may seem buried within it. Convinced? And this is just the short list! Yes, the job application process can be tedious, but if you want that extra shot at showing how you are different or telling the hiring manager exactly “why” you want this job, a well-thought out cover letter is the answer, and customization is key. P.S. Read our post on how to close your cover letter strong and land the interview. Spectrum Brands is a global $5 Billion Consumer Products company headquartered in Middleton, Wisconsin. While you may not be familiar with the Spectrum Brands name, there is no doubt you will recognize some of our brands. Spectrum Brands is a global consumer products company headquartered in Middleton, Wisconsin. Grow in a fast-paced environment while working with top brands like George Foreman, Rayovac, Remington, and more. View our latest job openings and internships here.